SEJONG -- South Korea’s political parties are likely to enter election mode as early as in the second quarter of the year, which is expected to be a great showdown between ruling and opposition parties under the Moon Jae-in government. For the coming 21st National Assembly, the general election is scheduled for April 15, 2020. According to polls from Gallup Korea, the support-rating gap between the ruling Democratic Party of Korea and main opposition Liberty Korea Party posted 16 percentage points (37 percent versus 21 percent) as of March 21. The polarization between the two rival parties has narrowed drastically over the past five months: The ratings for the Democratic Party and Liberty Korea Party were 48 percent and 11 percent, respectively, with the gap at 37 percentage points, as of Oct. 4, 2018 in a research by the same firm. The survey by Realmeter showed that the bilateral gap has narrowed by 8 percentage points, 39.9 percent versus 31.9 percent as of March 20. Apart from a certain portion of citizens’ reported disappointment over core policies of President Moon, recent polls showed Moon and the ruling party losing popularity in the southeastern part of the country. In the Gallup Korea poll, the Liberty Korea Party (36 percent support rating) overtook the Democratic Party (27 percent) in the region of Busan, Ulsan and South Gyeongsang Province. (On Oct. 4, 2018, figures for the opposition Liberty Korea Party and ruling Democratic Party were 12 and 52 percent). In a similar vein in the Realmeter result, the Liberty Korea Party outran the Democratic Party by 39.4 percent to 36 percent this month. 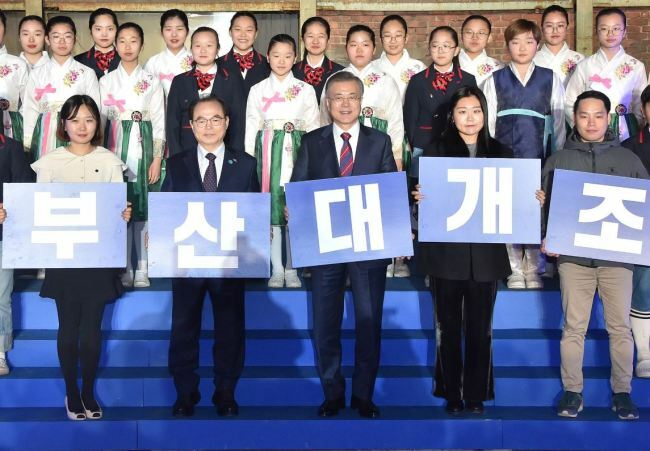 Two years ago, the area contributed strongly to Moon’s victory in the 2017 presidential election and the ruling party’s landslide victory in the 2018 local elections. The region has the nation’s second-largest population and second-most parliamentary seats, right behind the Seoul metropolitan area. It is also the home turf of President Moon. In this changed situation, some market insiders, including online commenters, are raising allegations that pledges or remarks of Moon and governing party heavyweights are now aimed at appealing to voters in that southeastern region. The president has instructed to reassess the feasibility of a formerly confirmed project in 2016 under which Gimhae International Airport, located in Busan, would be remodeled and expanded. Another option for building a new airport in the nation’s southeastern region has been scrapped. Gadeokdo has come to the fore again as a promising location. As part of the port city of Busan, the island is located between Gimhae and the island Geojedo. Regional leaders highlight safety matters at Gimhae Airport stemming from physical limits on runway length, as well as aggravated noise pollution that would inevitably result from an extension as scheduled. Another issue for the parliamentary election will be a second phase of probable project for regional balanced development. The plan, initiated by ruling party lawmakers, features relocating an additional batch of public agencies, including state-funded firms and institutes, from the Seoul metropolitan area to provincial cities nationwide. Democratic Party Chairman Lee Hae-chan has said the party would push forward “relocation of 122 more public agencies” from Seoul, Gyeonggi Province and Incheon. For part of the unsettled relocation scheme, backlash has emerged in the finance sector. Some lawmakers are striving to attract the headquarters of the two -- the Korea Development Bank and Export-Import Bank of Korea -- to the financial services-oriented district of Munhyeon-dong, Busan. Busan is South Korea’s second-largest city and South Gyeongsang Province is the second-largest province. Ulsan is the sixth-largest metropolitan city. As of February 2019, the number of residents in the southeastern region reached 7.96 million, which accounted for 15.3 percent of the nation’s population. He cited past cases where ballots for liberals in the Seoul metropolitan area offset their loss in the Gyeongsang area. 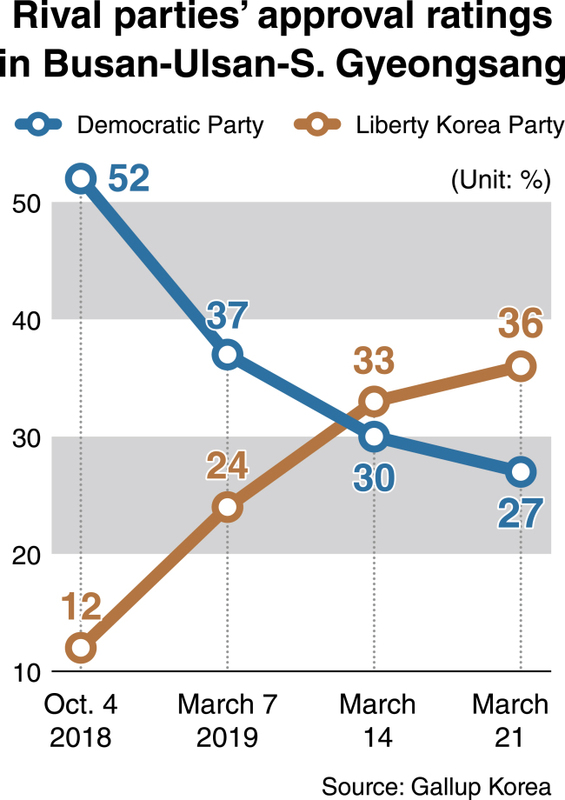 The Democratic Party marked 37 percent in Seoul and 40 percent in the Gyeonggi Province and Incheon area in the cited Gallup Korea support ratings, while figures for the Liberty Korea Party were 19 percent in each of the two.